The world’s most widely used insecticides have contaminated the environment across the planet so pervasively that global food production is at risk, according to a comprehensive scientific assessment of the chemicals’ impacts.The researchers compare their impact with that reported in Silent Spring, the landmark 1962 book by Rachel Carson that revealed the decimation of birds and insects by the blanket use of DDT and other pesticides and led to the modern environmental movement. via Insecticides put world food supplies at risk, say scientists | Environment | The Guardian. 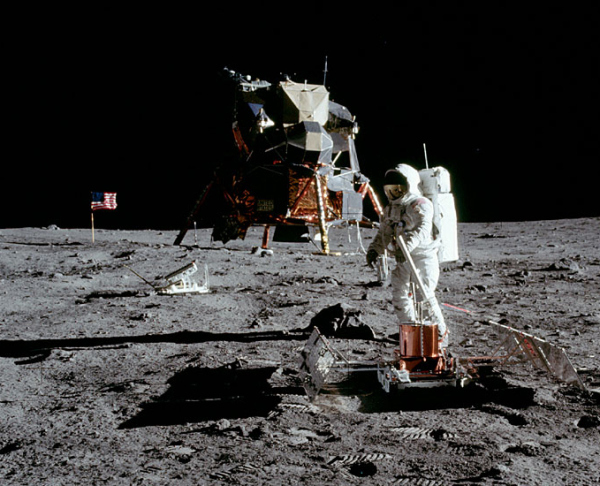 When you write about space as often as I do (and use a laptop with a big NASA sticker on the cover no less) you’re occasionally going to get the question posed to you: did we really land on the Moon? (That, and “do you believe in UFOs?”) And with this year marking the 45th anniversary of the Apollo 11 Moon landing — which, by the way, most definitely happened — and this particular weekend being 45 years since the Apollo 10 “dress rehearsal” lunar orbiting mission, I thought I’d assemble a list of a few oft-purported “proofs” of a Moon landing hoax… and then let you know why they’re completely wrong. Most of us know that Pi or π has something to do with circles — or a guy in a boat with a tiger. But what’s grade 4 maths got to do with high-end physics?Pretty-much everything. Pi is in the circumference and area of every circle, and in the volume of every sphere too. And from planets to force fields there’s no shortage of those shapes in nature — so it’s not surprising that Pi turns up in equations describing orbits, rotation and the strength of fields that spread out in all directions. via Life of 3.14159… › Bernie’s Basics ABC Science. The way the brain “boots up” from anaesthesia has been detailed in a new paper that shows the return to consciousness is a staged journey rather than a direct leap.The findings, published this week in Proceedings of the National Academy of Sciences, could have implications for bringing people out of coma, and improve monitoring of patients under anaesthetic.Senior author Assistant Professor Alex Proekt, at Weill Cornell Medical College in New York, likens the return to consciousness to re-booting a computer. via ‘Booting up’ the brain after anaesthesia › News in Science ABC Science. Willie Wagtails, race “leucophrys”, “own” the place where we lived until 2006, 20 km South of Narrabri. They were in our garden almost all year round and nested in the trees around the house, sometimes more than one couple within 20 m distance of each other. via Willie Wagtail Rhipidura leucophrys. I love these little birds – friendly and plucky and give me so much enjoyment with the watching of them. There is a whole family of shrubs/trees called Callistemon, or Bottlebrush. These trees/shrubs with dense foliage are a valuable source of nectar, when flowering. Several types of honeyeaters feed on their nectar. Some small parrots/lorikeets will take either nectar or the budding flowers too. Having dense foliage, bottlebrushes are also popular with some bird species for nesting. Bottlebrushes are often found in heath or along often sandy creekbeds. via Birds of Australia key plants: Bottlebrush Callistemon […]. What lives in Brazil and looks like a football? Brazil’s official World Cup mascot. The three-banded armadillo is a mammal native to Brazil’s dry tropical forests, and rolls into a ball when threatened. But nearly half of the armadillos’ habitat has been cleared. via The World Cup is a chance to save Brazil’s ‘football’ armadillos. In 2011, I was given the opportunity and great honour of travelling with the Australian troops involved in Operation Slipper into Afghanistan.For many years I’ve examined the way young men behave and exist in Western society. My deployment through the Australian War Memorial was in some ways the exclamation mark to that long road.I was intrigued to see young men facing their ultimate fear and their own mortality amidst the very confronting human creation of war. via After Afghanistan: the faces of war – The Drum Australian Broadcasting Corporation.